Welcome to Carl & OAK Bespoke. Carl & OAK specializes in quality leather shoes for men and offering full customization with our made-to-measure services. Our vision is to become an internationally recognized shoe brand that is a serious contender in this traditional industry, with our innovative processes to deliver luxury quality with up-to-date fashion style relevant to today’s gentleman. WE WANTED TO CHANGE THE WAY MEN BUY SHOES. FUNDAMENTALLY. In traditional retail a designer pair of shoes is marked up 8x by the time it reaches the customer. 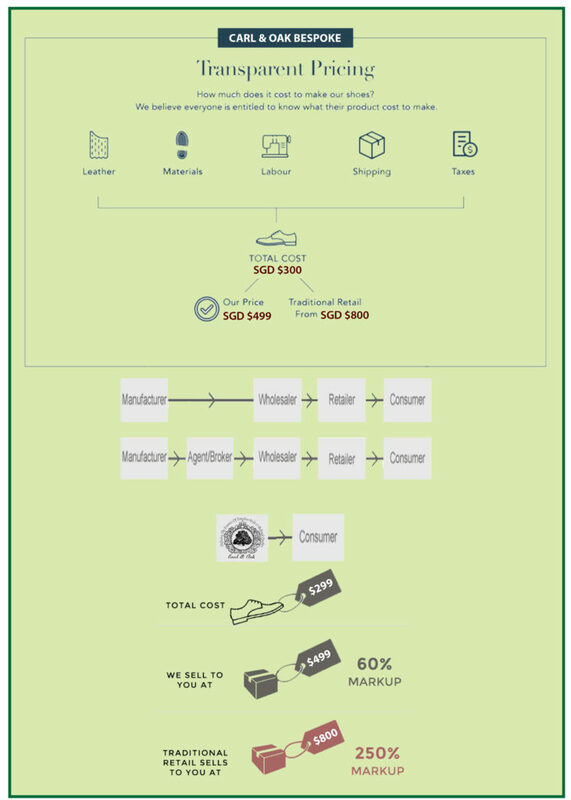 By being working directly with shoemakers and adopting ‘no-ad’ branding, we eliminate traditional markups and pass these savings on to you. Traditionally, even a good pair of leather shoes has a limited shelf live. 2 years for a cemented dress shoes, and 5 years for a stitched one, in the warehouse of shoe sellers. This explains it is common for one to buy a ‘new’ man shoes which gave way in couple of months. CustomMade shoes not only meant shoe that is made to your unique feet measurements for comfort with your own fit, it also meant a pair of good new shoes you can rely on, that take you to places.